The real science behind intermittent fasting methods…and why this is the finally the answer you’ve been looking for! So if you want to finally look great and feel healthy, get the Intermittent Fasting for Women 101 audiobook now! It's packed with info that can really change the way you look and feel. This is some life-changing info! I love how this book debunks the myths surrounding the weight loss industry. Awesome read. This book is truly spectacular! It teaches you how you can finally achieve the life-changing weight loss transformation you've been long yearning for. This book is super insightful. Reading it will allow you to see intermittent fasting in a new and better light and it will also motivate you to get off your couch and strive for a better-looking, healthier body. An audiobook that is wonderfully crafted is the type of audiobooks I love listening to. This book was one of those. First off, it taught me a lot about intermittent fasting and how to apply it to my lifestyle so the information was great. Next, the narration was superb too. It kept me engaged the whole time throughout this 5-hour book. To me, that's a wonderfully crafted book! This is it guys and gals. Look no further and get this book so that you can get started on your weight loss journey as soon as possible. 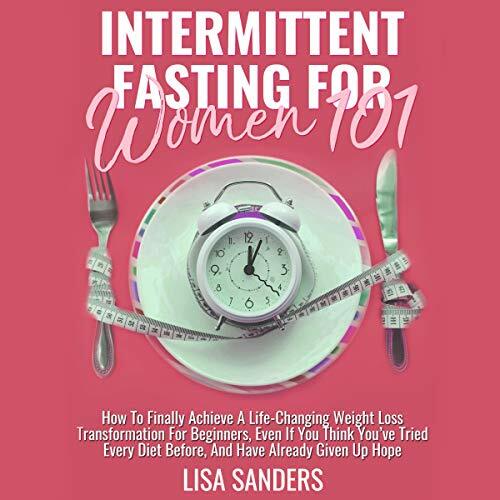 As the book's title suggest, intermittent fasting for women 101 is very beginner friendly and 101-ey. Very grateful for this book! This book couldn't have come to me at a better time. I'm currently going through a rough time because of my weight and I need to lose it quickly. This book made me feel rest assured that I can lose that weight and lose it quickly. I'm very grateful for this book! This book was very eye-opening. I discovered that losing those stubborn pounds isn't really as hard as I think and that all it requires is the right methods. Follow the right methods, and get the results you desire. Are you looking for a way to lose weight and look better? Yes? Great because intermittent fasting is the way to weight loss and reading this book will equip you with all the knowledge you must have in order to successfully intermittently fast daily. This is how you'd want to live your life. I always thought that life would be sad after following an intermittent fasting routine. But listening to this book and following the diet myself made me realize that this is how I'd want to live my life - healthy, confident, and lean! Listen to this audio book now! The health benefits of doing intermittent fasting is just insane. It's like a health hack and a weight loss hack altogether. Trust me when I say, listen to this audio book now! Most people I talk to who are overweight are not even willing to read a book to help themselves. Please don't be that person and help yourself. Can you learn how to lose weight for free? Yes, sure but reading this book will cut your learning curve by 90%! I love the way it explains how intermittent fasting works and why it's the way for you and me to lose the weight. Amazing book! No diet will work if you don't first believe in yourself. So I urge you that when you get this book, believe in the book and when you're about to go on the intermittent fasting diet, believe in yourself and really believe because that's the only way to lose weight successfully. Listening to this book gave me many many new insights that has helped me lose more weight with the intermittent fasting lifestyle approach. This book is definitely the one. I bet if you're reading this comment that you've struggled with your weight. Here's the thing. I've also struggled with my weight but it was when I discovered intermittent fasting that the problem was really solved as I've lost the excess weight I needed to lose. Now if you're wanting to lose weight too and solve your problems, then this book is definitely the one. Live, eat, and breathe intermittent fasting. Intermittent fasting has been an amazing way of lifestyle. It doesn't feel like I'm dieting and perhaps, that's the best part of all. I can just change my habits and meal timing instead of restricting myself. Audio was nice and the writing was good too . Loved this audio book ! Read this book if you're a beginner because it's one awesome guide for beginners. The intermittent fasting methods, tips and tricks you'll get out of this book will prove to be very helpful in your weight loss journey.